Other Names: Yellowfin, Ahi (Hawaii). Habitat: This fish enjoys the open ocean along currents that change temperature. Bait: Yellowfin can be caught by trolling live bait or a lure. Trolling lures, konaheads and plastic squid work well or you can at anchor with live bait and chum. 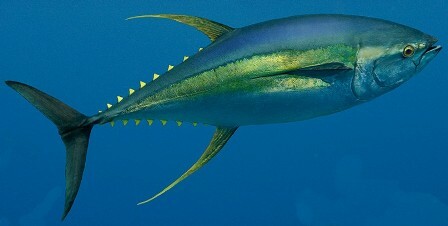 Fishing Strategy: Yellowfin tuna are one of the worlds fastest and most determine deep sea fighters. This makes for an exciting fishing experience that you will never forget. Eating Quality: Yellowfin meat is highly valued in the Japanese markets.